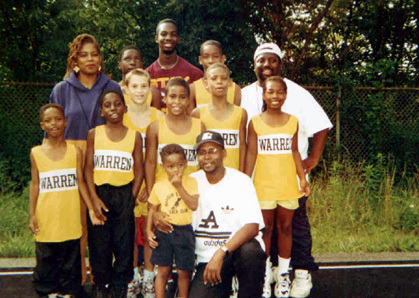 Jack C. Thornton, Jr. started the Warren Striders Track Club for the youth of Warren, Trumbull County, Ohio. A former native of Steubenville, Ohio and "Big Red" graduate, Thornton began his coaching career and teaching profession after completing studies at the College of Steubenville and Boston University where he obtained his Bachelor and Master Degrees respectively. Thornton had competed in Track, where he ran the then mile and 880 while in high school. Thornton became the assistant boy's track coach and a Social Studies Teacher at Warren Western Reserve High School in 1971. Thornton became head boys track coach in 1974 and began to fulfill a vow to give a darn about the sport and his student athletes. Thornton gave his time, effort and even his own money. Thornton's commitment was the key which created the idea that has evolved into the Warren Striders Track Club, whom he founded in 1977. Despite naysayers, Thornton's dedication to track in Warren, Trumbull County, Ohio, and the creation of the Warren Striders Track Club will embark on its 27th year of operation in 2004. Thornton continues to operate the program with an all-volunteer staff, many of whom are former student athletes. Thornton and his staff motivate challenge, push, and inspire the youth in the Striders. As a result, more than 300 student athletes have been impacted by participation in the Striders' Summer program. Thornton continues to encourage youth to become involved and to always give something back. Thornton is known by many titles: "Coach", "JT", "Mr. Thornton", "Coach Thornton", "Mr. T" are just some of his titles. Thornton has received many honors for his dedication to the youth of the Warren community as a coach and educator. Thornton was selected as a Jennings Scholar in 1972. The Striders honored Thornton for 20 years of service to Warren Youth in 1997 and in 2000 he was inducted into the Warren Sports Hall of Fame. Thornton, retired (2001) as an educator in the Warren City School System, will embark on his 27th season with the Warren Striders. Thornton looks forward to expanding the club's impact in the Warren, Trumbull County, Ohio community, as well as throughout the state, nationally and perhaps internationally.